Alliance for Progress Charter School (AFPCS) is a community�based K-8 school in the heart of North Philadelphia, just a few blocks from Temple University. It was founded in 1998 by the Women's Christian Alliance, a social service agency serving the North Philadelphia community for more than 90 years. The vision of AFPCS is to empower children to develop knowledge, skills, attitudes, behaviors and technological competence that will make them lifetime learners and achievers in a technologically oriented world. At AFPCS, we believe in the power of community to unite us, to enhance our understanding of ourselves and others, and to enrich our lives. We seek to create a model community that expands the horizons of our students by helping them invest in themselves as individuals and also as members of a group. We also seek to engage cooperatively with other community organizations in efforts to strengthen and renew the neighborhoods that surround our school. 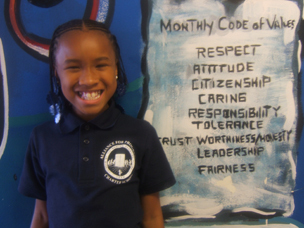 At Alliance for Progress Charter School, we put children first. We define ourselves as a learning community, recognizing that students learn best in an environment that supports learning for all. Since learning is a life-long activity, we encourage everyone in our community to seek greater knowledge, to upgrade their skills, to advance their thinking, to pursue education that will improve the quality of our school community as well as the quality of the lives of individual learners. Everyone who works in our school is a model for our students, reinforcing the value of learning in a caring community, designed to help, nurture, support and encourage as well as to demonstrate the value of discipline and hard work. It is the mission of AFPCS to ensure the achievement and success of every students through a technologically rich and individualized learning environment. Using the latest tools, including technology, research-based methods of instruction, and hands-on learning in the tradition of John Dewey, we aim to help our students and their families set and achieve ambitious educational and personal goals. We provide for students a rich, integrated curriculum, focusing on language arts, mathematics, science, social studies, art, technology, and physical education. We set high standards for all members of our community, students, teachers, parents and staff, and we provide the support necessary to attain those standards. We expect the highest code of conduct from everyone in our school, including respect for each other, honesty, integrity, personal responsibility, and the willingness to work hard to achieve the goals set for our students and ourselves.